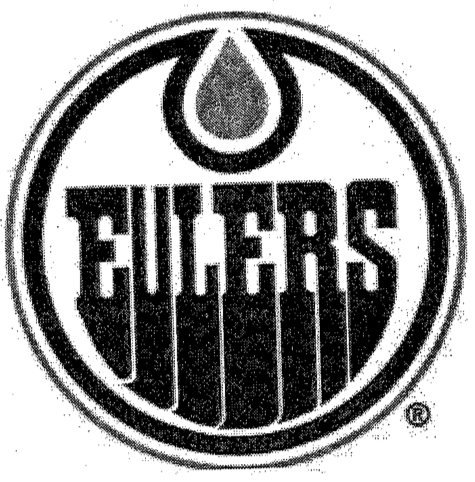 A few years ago I found an alteration of the logo of the Edmonton Oilers (a Canadian hockey team in the NHL) in which “Oilers” was replaced with “Eulers.” I printed it and hung it outside my office door. Now I can’t find the original, but you can see a scanned copy on the left. Ticket prices started out at $1.50 on February 1, topping out at $2.67 on February 29. Fan reaction to the temporary change was mixed: in general, casual fans were deeply confounded and upset by the change, while more mathematically-oriented fans welcomed the change with open arms, some going even so far as to suggest that it be permanent. The tension and confusion were relieved on March 3, when the Oilers reverted to their old jerseys for an away game against the Winnipeg Jets. The edit lasted for about 2 hours. While of course, it would be really cool if this were a true story, it is easy to debunk. No, I didn’t go to Snopes, I just looked at the Edmonton Oiler’s schedule. It turns out that they were founding members of the World Hockey Association and this league’s first season was 1972-3. The Oiler’s first game was October 30, 1972 (as the Alberta Oilers), several months after the supposed name change. Update May 28, 2018: Colin Hartnett informed me that this was the name and logo of the Brown University math department intramural hockey team in the early 2000s. But he did not know if they came up with the idea and logo. What’s next, the Calgary Bernoullis?